Use this first-generation SBI EF1α-hspCas9 SmartNickase when you want to reduce off-target events, have transfectable cells, and prefer an intact vector. For pre-clinical and other applications where you need to minimize off-target Cas9 activity and are using transfectable cells, All-in-one Cas9 SmartNickase plasmids are an excellent choice. 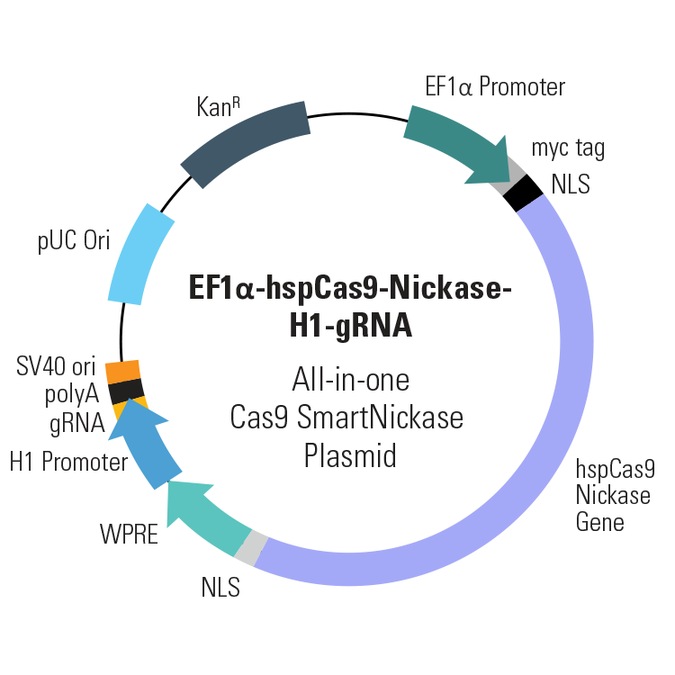 Unlike our newer Cas9 constructs, this first generation Cas9 SmartNickase—EF1α-hspCas9-nickase-H1-gRNA All-in-one Cas9 SmartNickase Plasmid—does not contain a selectable marker for identifying transfected cells and is now available as an intact, circular plasmid. As with all of our Cas9 Nickase delivery options, the EF1α-hspCas9-nickase-H1-gRNA Plasmid is functionally validated and comes backed by our expert technical support team—if you’ve got a genome engineering question just ask by emailing tech@systembio.com.